Life Coaching... What's it all about? 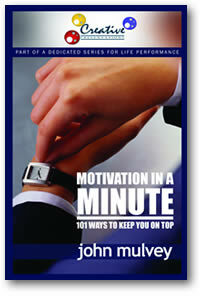 John Mulvey is a well-respected business development consultant, life performance coach and author. His coaching has included, executives, business leaders, MP’s, and individuals wanting to improve their situations. He’s a former president of The National Speaker’s Association Qld. Chapter, and as a professional speaker has shared many stories with disparate groups over the years in Australia, New Zealand, the UK and USA. This exposure has resulted in his being invited to many areas of business to work with groups as well as individuals. Some of his client’s include: PwC, Rio Tinto, BHP Billiton, Dulux, The University of Queensland, The University of the Sunshine Coast, Royal Institution of Architects, VACC Insurance, Brisbane Airport Corporation, Virgin Blue, ANZ, Bendigo Bank, Bank of St. George, and numerous Queensland Government Departments. Individuals have come from all walks of life; young and not so young! Coaching is something dear to his heart, having been in the British army as a Physical Training Instructor and coached soccer teams in the Far East in addition to subsequently running the Wilmslow Junior Football Club in the UK. He is a certified referee and level 2 soccer coach, although he doesn’t pursue those interests these days. 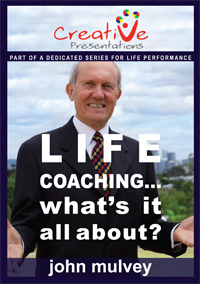 Life performance coaching requires an accreditation of course and John received qualification when this really took off in and around the year 2000. There is no doubt that life coaching is growing in popularity and in many areas replacing team and personal training. The difference as John sees it is down to the fact that one size doesn’t suit all and recognising individual requirements only comes about from asking quality questions to find where people are at and where they would like to be. Motivation can only come from within and many of us lack the constant reminders to get us high without the aid of manufactured substances. What John has provided in this book are motivational thoughts that take less than a minute to jog the mind into being proactive. They will stimulate you to look at situations differently. There are over one hundred inspirational thoughts that will have you smiling, nodding and creatively thinking. All the thoughts in the book are duplicated on CD's if you prefer listening to reading. The CD's have appropriate sound effects to amplify and complement the ideas. Insights from some of the great minds in history are included as sources for shining lights in temporary darkness and calming words in moments of panic. You'll find comfort and direction in this positive anthology that will lift you and keep you on top. "Simple Speaking Means Communication." Learn brilliant tips on how to stage and successfully run an event, from the aspect of being in charge as an MC to getting your personal message across. As the title suggests, the methodology is simple and the effects outstanding. From knowing where to start to what to wear and then what to say and how to say it, this book is jam packed with easy to understand information. Even hints on protocol and time management are provided in a useful comprehensive way. You'll gain so much from this book that will enable you to organise functions, present your information in a matter-of-fact way, and ultimately, conduct a successful event. You'll learn about expression and want to practise the simple speaking approach that John advocates. John will raise your awareness with regard to the words you use and how you express them, with a few insights into the inescapable body language. 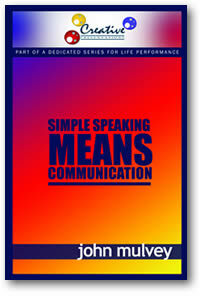 You cannot not communicate, so find out from John's book how you can do it better. 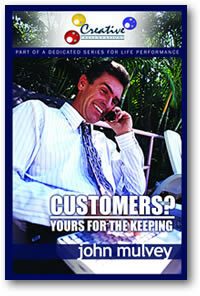 Customer Service has almost become an oxymoron, a contradiction in terms, in many countries. Service is the basic ingredient in dealing with customers and the main reason why they come back or not. In this book, you'll learn many skills and techniques that will have your customers becoming advocates for you. They'll want to speak favourably about you if you employ the attention to them that John makes simply obvious. From treating people well face-to-face to having them clamouring for your service over the telephone, John will pass on the secrets of true customer satisfaction. This is not neurosurgery, neither is it rocket science. It is the simple way to behave and attract, based on common sense and a positive attitude. Having fun in the market place is not a crime, and John is more than aware of the ingredients for successful relationships in the building of your service to customers. Most people have the capacity to speak, and yet developing the ability to speak well is often set aside for all sorts of reasons, not the least of which is fear. Allowing words to tumble out of your mouth without practising the art of getting your message across can lead to all sorts of misinterpretation. Saying what you mean and having your meaning clearly understood is both possible and powerful. You need to want to do it of course, and given that desire, then I believe that the contents of this step-by-step introduction to the wonderful world of effective verbal communication is a treasure house of easy to learn skills and techniques. 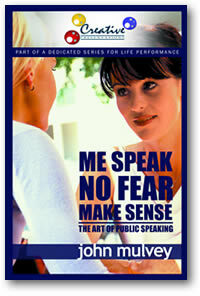 Learn how to speak well, without fear and to make sense every time! This book is for your own personal journey: a verbal vacation to enable you to stand and deliver communication via conversation, anywhere, at any time, to anyone.